Concert de l’Orchestre de Paris, the 27. Andrea Chénier, U. Giordano, the 28. Dantons Tod, G. von Einem, the 29. Die Frau ohne Schatten, R. Strauss, the 30. 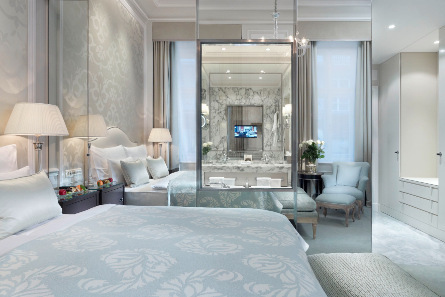 Located on the ring road, at same distance between the legendary Musikverein and the Vienna Opera, the Imperial ***** is a luxurious Viennese hotel built at the end of the nineteenth century for the Würtemberg princes. It offers 76 rooms and suites in a sober and luxurious atmosphere. 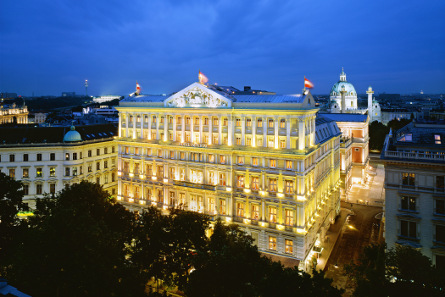 Built in 1876, the famous Sacher hotel *****, has become an institution of the Austrian capital. Standing in the heart of Vienna, facing the stage door of the Opera, the Sacher is the meeting place of Viennese high society. In keeping with the tradition of offering a true “home” to the guest, every room and suite is decorated with taste and style. 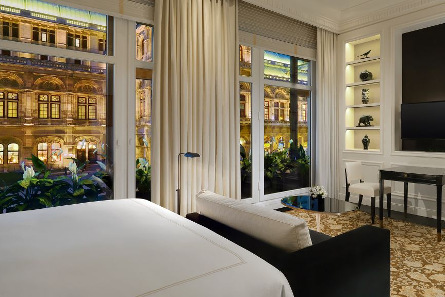 Of superior comfort, the rooms also provide authentic baroque furniture and 19th-century paintings. 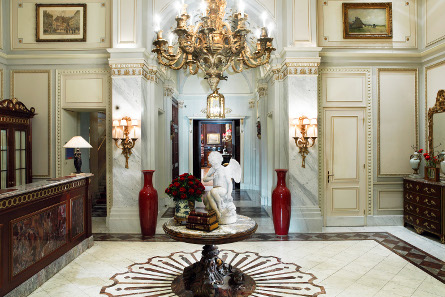 You will not miss at the hotel the fine chocolate cake of the same name, the cosy Rote bar restaurant or the Sacher spa that proposes a multitude of body cares, including the Sacher Hot Chocolate care. Standing next to the Opera house, the 5 star Bristol hotel, which opened in 1894, has conserved its unique character in a luxurious and refined atmosphere. Its 150 rooms are decorated with valuable furniture as well as works of art and offer all modern conveniences. Enjoy a glass of champagne after the opera performance in the traditional Bristol Bar - still the heart of Hotel Bristol. 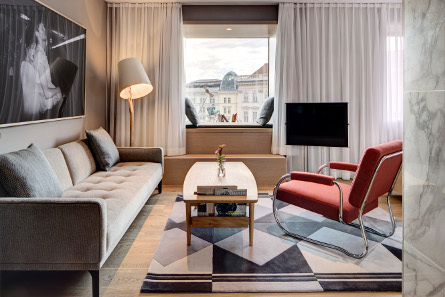 The Guesthouse, ideally located behind the Opera and in front of the Albertina, offers modern and unique rooms. The contemporary furniture gives a private atmosphere and visitors will enjoy an unforgettable view of the city from every room by day and by night. 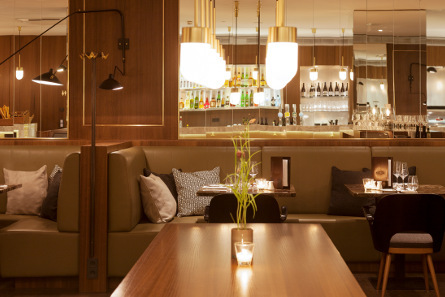 Breakfasts are served at the ground floor where you will find the restaurant Brasserie & Bakery that combines perfectly traditional dishes and modern cuisine. 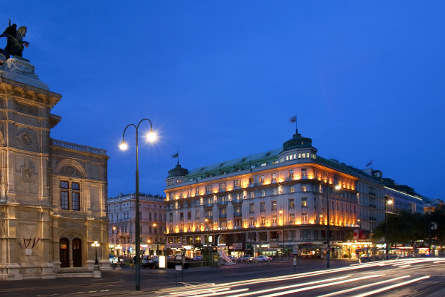 The Kaiserhof hotel **** is ideally located in the heart of Vienna at less than a fifteen-minute walk from the Staatsoper, in a quiet little street. 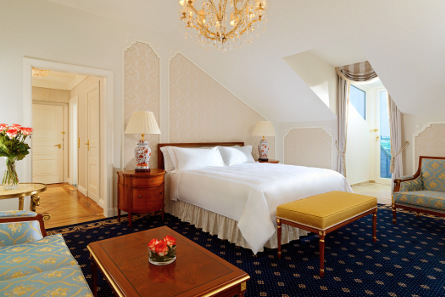 Its 74 elegant and charming rooms combine traditional decoration and modern facilities. A bar, a cosy winter garden, a sauna, a Turkish bath and a fitness centre will complete its installations. 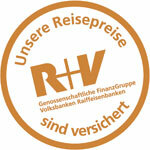 Not to be missed, the hearty breakfast with its Viennese specialties, that will delight all the guests. Overnights including breakfast, good opera tickets, scheduled flight, return taxi transfers, travel cancellation expenses insurance.